It&apos;s looking like cooler weather this weekend, and I can&apos;t wait to break out my fall wardrobe and enjoy some fall activities. Hendricks County, Indiana, has several great events going on this weekend. As always, be sure to check our Events Calendar for a full listing of activities. This would be a great weekend to head to the Hendricks County Courthouse Square in Danville to check out the annual Scarecrow Display. The new scarecrows arrived this past weekend and look great. Stroll around the square and admire the amazing displays created by locals. While you&apos;re in Downtown Danville, be sure to stop by some of Danville&apos;s best restaurants and shops, including Red&apos;s Donuts, Mayberry Cafe, Seize the Night Designs, The Royal Theater and more. The scarecrows will be on display through Oct. 28. One of my absolute favorite things to do in the fall is visit Beasley&apos;s Orchard. This is the second and last weekend of Beasley&apos;s biggest event all year -- the Heartland Apple Festival. 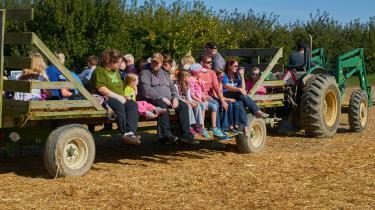 The festival includes hayrides to the orchard&apos;s 15-acre, u-pick pumpkin patch, a corn maze, live music and entertainment, face painting and much more. Here&apos;s my insider tip: Be sure to stop for an apple cider slushie inside the barn market. They are delicious! The Roots Market pop-up vintage and handmade market will take place Friday and Saturday. Stop by the Hendricks County 4-H Fairgrounds & Conference Complex in Danville between 9 a.m. and 6 p.m. either day. Shop vintage and handmade goods, plus enjoy some great food, a cash bar, autumn drinks, music, on-site pumpkin patch and more. Help prevent child abuse by attending the Hendricks County Kids Fair sponsored by Prevent Child Abuse Hendricks County. The event will be held at the Hendricks County 4-H Fairgrounds & Conference Complex from noon-4 p.m. on Saturday. The kids fair will include giveaways and activities for children, music and live entertainment, the Circle City Ghostbusters, Courage and Kindness Princesses, local police and fire trucks, car seat inspections, free food and refreshments, a winter coat giveaway, bounce houses and more. 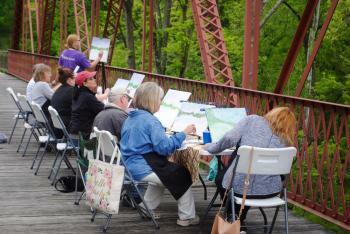 Get in touch with your artistic side and paint the great outdoors. An instructor from The Purple Palette will lead painters age 6 through adult from 10 a.m.-noon Saturday at Sodalis Nature Park. Cost is $30/person, and you must register in advance by clicking here. So, get out there and enjoy this weekend before winter arrives!